One of my most favourite things about summer camp is that no day is ever the same. Sure it runs on the same schedule – breakfast at 8, activities until 12, lunch at 12:30, more activities until 4:30, dinner at 6, evening activity until 8:30, put the kids to bed at 9, hang in the staff lodge until curfew – but something different will happen in each of those blocks of time. No two lessons are ever the same, the food changes daily, your campers made you mad yesterday, but today they make you laugh… you get the idea. Summer Camp is ‘flipping’ awesome! Sometimes though, there are things that will absolutely make your day, and if you can get a run of these things over a few days (or even have them all happen in the same day), there’s nothing quite like it. Oh it’s the simple things that make a summer camp counselor happy. 1. You wake up and realise you haven’t overslept and don’t need to rush to get into the bathroom before the kids! You take your time getting out of bed just because you can. 2. There are bagels and cream cheese for breakfast. They’ve restocked the Marshmallow Mateys (that’s a cereal – you’ll understand when you get to camp) and one of your campers has put two packs on your plate to make sure you get your daily fix. Oh god you love these kids. 3. It’s sunny and hot, and you roll up your sleeves as you teach your first few lessons of the day… playing with kids, getting paid AND you get a tan? Why didn’t you sign up to do this before? 4. It’s rest hour, and you have no obligations and nothing to do other than sit in your bunk with your campers, read your book, write a letter home, have a snooze and listen to them chatter. Your favourite camper surprises you with a friendship bracelet they’ve been secretly working on. You wear it with pride. Some of the best days involve a slip n slide! 5. You’re not on duty for R&R/shower hour, so you don’t have to be with your kids, and the lifeguards have the pool open. Impromptu pool party with all your clothes on. Oh and then someone’s testing out a slip n slide set up on the hill. Obviously you get involved. 6. Dinner is pizza. Or pasta night. And desert is chocolate brownies. Not the ones with the strawberry stuff in the middle, but the proper gooey, stodgy ones that glue your mouth shut. And one of your kids doesn’t like them (weirdo), so you get two. Score. 7. 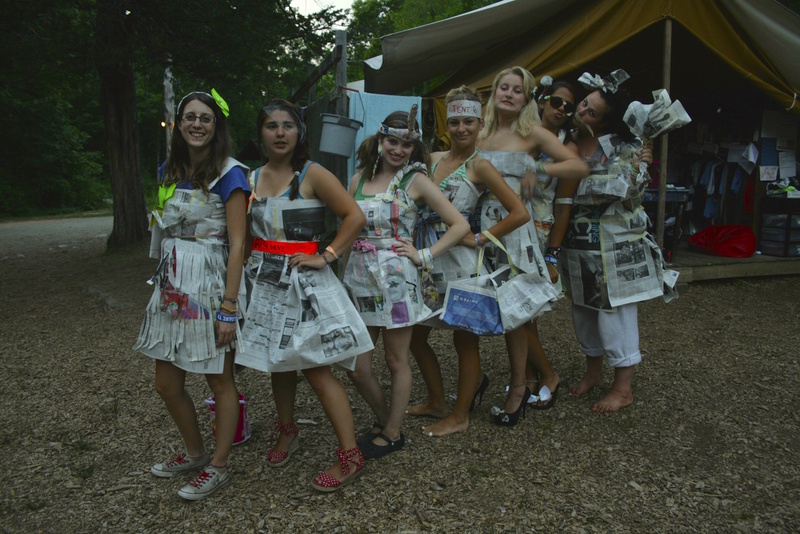 Evening activity is newspaper dresses. This involves staying exactly where you are (in your living section) and letting your kids create a dress for you made out of, yep, you guessed it, newspaper. Newspaper and a lot of tape. Tape on your arms, your face and even in your hair. Oh, and they do your make up too. Then you have a fashion show and the best dressed wins. You win. 8. Camper bed time. Your kids are feeling especially chatty tonight and want to tell you all about their day. They are awesome little humans, these children. So insightful and funny, and so open and willing to tell you all their stories. What do you mean, this doesn’t look good?! 9. You were going to go down to the staff lodge but then you went in the bathroom to shower and all your besties were in there. You end up having a bathroom party and just chatting about life for hours. Someone’s showering and the shower curtain falls down, causing a riot of laughter and shrieking . Funniest thing you’ve seen all day. 10. Bed is calling. You get into bed and for some reason it’s especially comfy tonight. You move your pillow and there’s a little note under it from one of your friends who lives in another section. It’s super sweet and funny. You vow to write one back tomorrow, as your head hits the pillow and you’re out like a light. How Much Does It Cost To Go To Summer Camp? Getting Your Visa: What Happens At The Embassy? © Rusja Foster and Summer Camp Secrets, 2017. Unauthorized use and/or duplication of this material without express and written permission from this site’s author and/or owner is strictly prohibited. Excerpts and links may be used, provided that full and clear credit is given to Rusja Foster and Summer Camp Secrets with appropriate and specific direction to the original content. Enter your email address to follow this blog and receive notifications of new posts by email. It'll be worth it. Promise.